Science Education Enrichment Day (S.E.E.D.) is a family themed festival celebrating science, technology, engineering and math. The 33rd annual S.E.E.D. was held on the campus of USC Aiken on Satirday, October 6, 2018 and provided an opportunity for engagement and exchange between children, teens, families, and local STEM professionals and enthusiasts. It featured exhibitors who provided hands-on activities, interactive demonstrations, and family-oriented STEM entertainment. There were 3900 people in attendance this year! 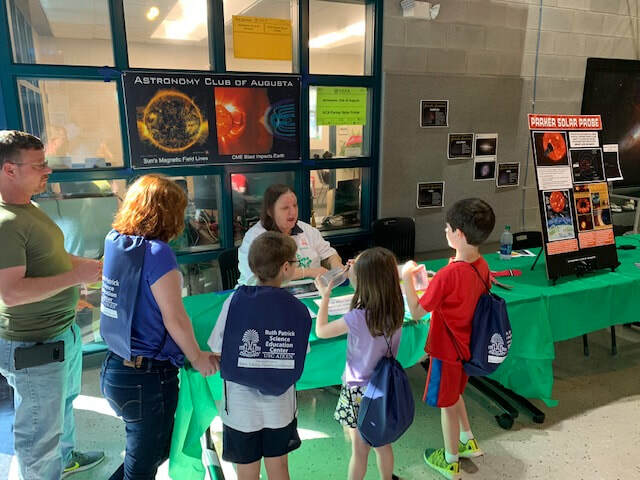 ​​While most of the members of the Astronomy Club of Augusta were outside braving an unusually hot day educating visitors about daytime astronomy, I staffed a table in a cooler location, inside the Ruth Patrick Science Education Center. I have fallen in love with the Parker Solar Probe and the idea of its 7 year mission to the Sun, but I wanted a hands-on activity for my young visitors. So, I chose magnetic fields, including those of the Earth and Sun, and how solar storms affect the Earth. It was a great day! A big thank you to my husband, who spent the day helping. 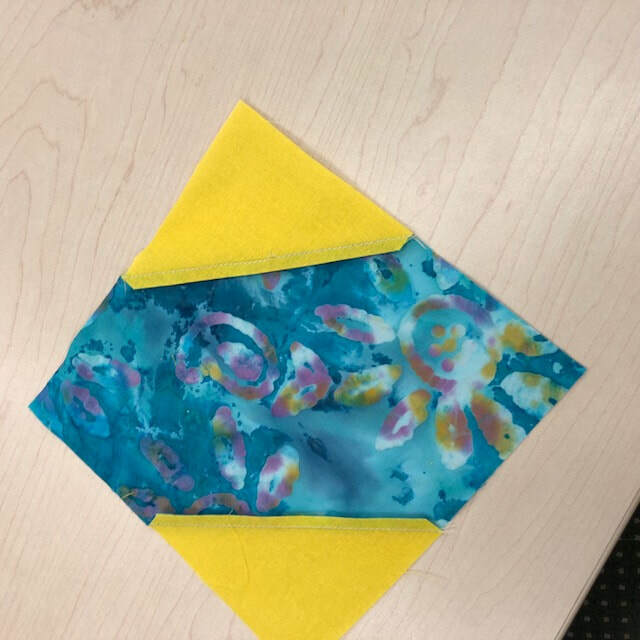 Incuded in the outreach service projects of the Carolina Pine Quilters is sewing pillowcases for local health care organizations. 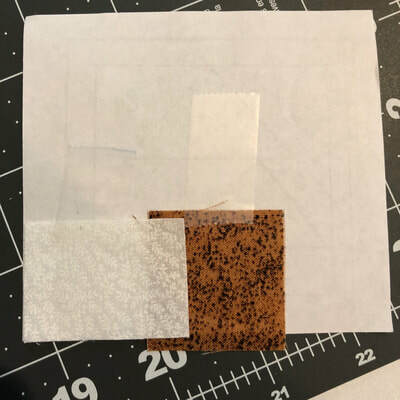 I decided to try and learned how to make French seams, too. I love YouTube! Always buy more material than you need. Fabrics that are listed in the same collection don't always work well together. 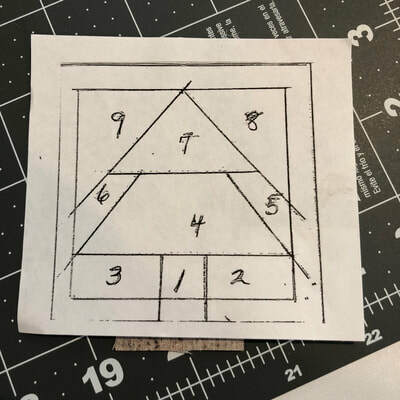 Fabrics that are listed in the same collection are not all the same width, regardless of the width listed. 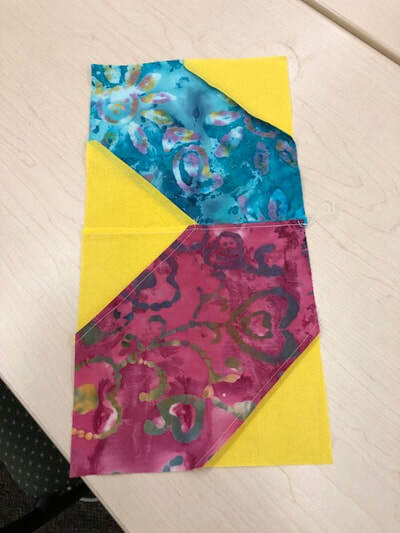 Sewing pillowcases is easier than making quilt tops. I need a better sewing machine. I finished my first quilt. Finally! I was chatting with my hair stylist and mentioned I had just taken an introductory class at Joann's. She told me one of her clients was a quilter and was going to offer a class soon. I took the class, along with two other lovely women, June 18-22. Jean R is a fantastic teacher, very skilled, and extremely patient. I finished the top, and Jean helped me assemble the layers before I did a simple "stich in the ditch" quilting on it. She also taught me how to attach the binding. It took me until last night to actually finish the binding. It required hand work that I had never done before. (One of my weaknesses is actually starting things, especially when they are a new skill.) I apologize to Jean for not following her guidelines when selecting the fabrics. Once the quilt was done, I understood how my choices affected the look of the rail. I have a lot to learn. I had purchased some woven labels that I thought would be cute to add to my quilts, because I don't think they are worthy of real quilt labels yet. I decided it would be nice to hand add a year. So, I found my Micron 08 that I had bought especially for quilts, and it bled. Apparently, the ink behaves differently on quilting cotton than it does on rayon taffeta. The fibers are very fine and move the ink along beautifully. Now it was a challenge! It really wanted to add the year. I tried two Sharpie permanent markers, fine and ultra fine; a Sharpie Rub-a-Dub laundry marker, and a Staples Opti-flow. They all bled. 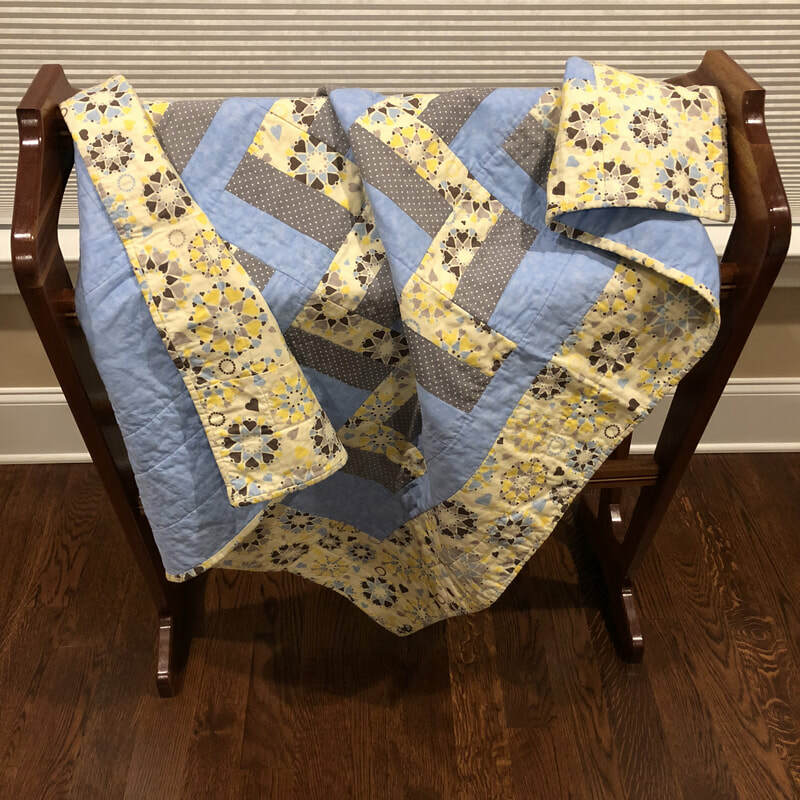 My intention was to donate this quilt to the Children's Place here in Aiken, but Ted says I should keep it, because it is my first quilt. If I do, I will make another one to give away. I haven't decided yet. I chose the colors in this one for a little boy, not for me. By the way, Jean and I belong to the same guild, the Carolina Pine Quilters, and I took a second class with her. We made a wall hanging. When I get it done, I'll share it with you. Here's a teaser. I, again, did not follow her color suggestions. Big mistake. I attended a local workshop on abstract painting. The instructor wanted us to experiment with paints, brushes, various objects as stamps, texture, etc. We were supposed to play. Beyond the painting itself, this was not an easy assignment. After 40 years of making themed bulletin boards, the idea of just playing around was not something that I was able to get into 100%. However, I did have something in mind that I wanted to "respresent." The painting above is the final product. The one below is my practice on paper. I'm not hanging either one up on my wall. I'm posting this under "Crafts." If I ever feel proud of one of my creations, I'll open "Painting" as a new category. 6. My Badge - Harder than it Looks! 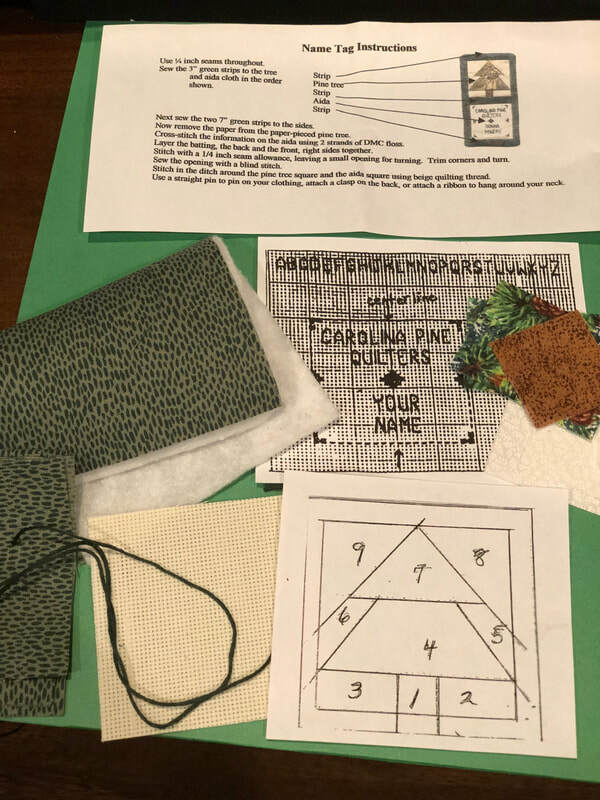 As a new member of the Carolina Pine Quilters guild, I received a kit with basic instructions on how to make my badge. 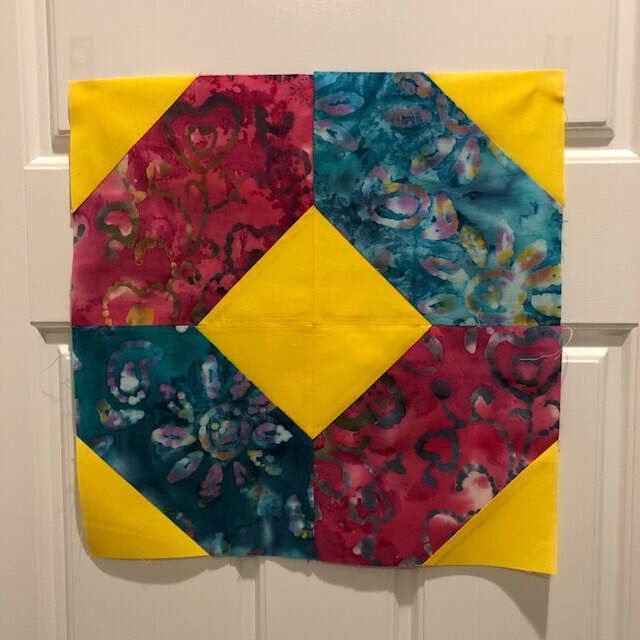 Since I am new to all things related to quilting and sewing, this was another challenge. Paper piecing for the tree. Cross-stitching on aida that was skewed. Stich in the ditch around the borders. Poking the corners out (total fail). Hand closing the opening once I turned the badge right side out. Whew! 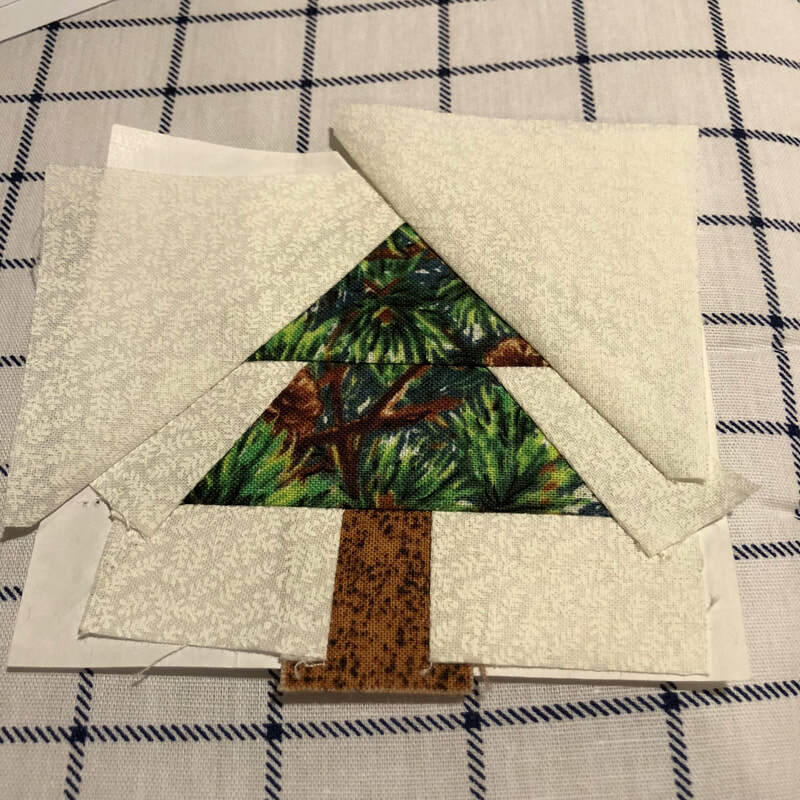 Although the tree and the cross-stitch square below it are centered relative to each other, I somehow messed up when I sewed the borders on. Since the fabric was fraying quite a bit, I had a good excuse to not rip out the seams and try again. I went with the adage that sometimes done is better than perfect! I'm still deciding which one of the three ribbons to pick for my neck strap. I'm not sure, but I am leaning toward the one in the middle. I needed to find a way to organize my sewing machine needles. The packages they come in just were not working for me, and my eyes are too old to search through the teeny numbers on the needles. I couldn't find anything online meant for needles. However, as a former science teacher, I thought of vials. I found these 5mL vials at a good price on Amazon, and they are the perfect size for my Singer needles. 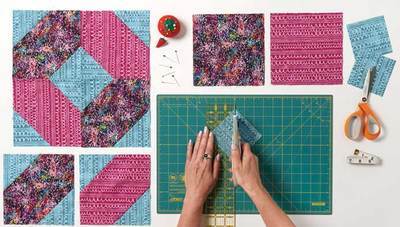 If you are a sewer or quilter, Id love to hear how you you manage your needles. 4. 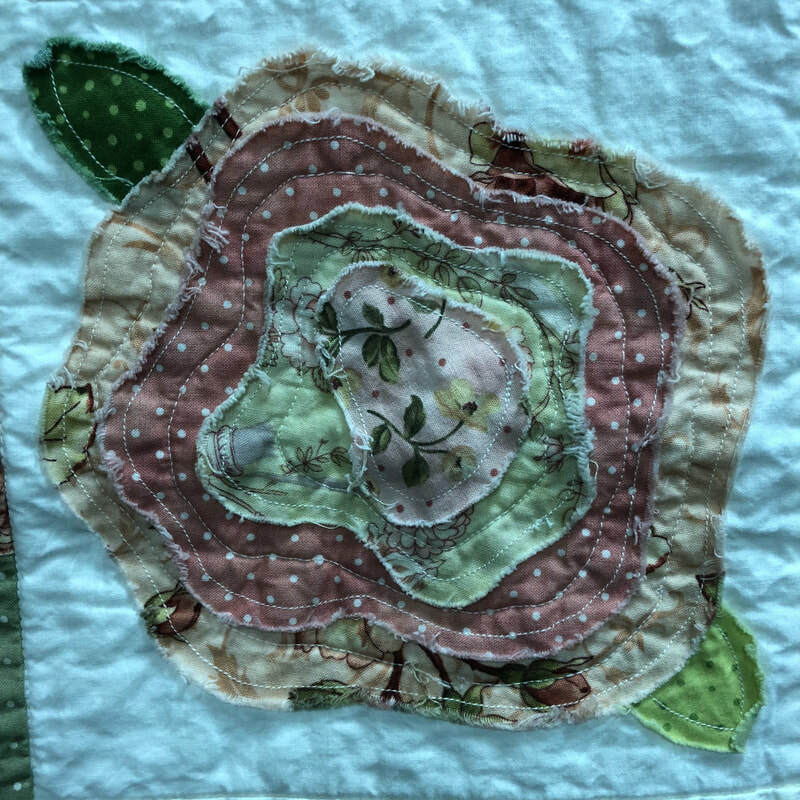 Nope - not my French Roses Quilt! I bet I took some of you by surprise, if just for a nanosecond! I wish I could tell you I was coming along with my quilting skills that quickly, but that is not the case. When I mentioned to Kathy M, a lovely lady in my community, that I was interested in quilting, she talked to her friend, Pat Jones, who just happens to be the current President of the Carolina Pine Quilters, here in Aiken SC. Pat invited me to their March meeting, and I am very happy I decided to attend. There were about 50 members there (including one man), and they were very warm. welcoming, and enjoyable to chat with. The meeting began with some personal shares, followed by business and a guest speaker, and ended with a "show-and-tell" of current projects by the members. 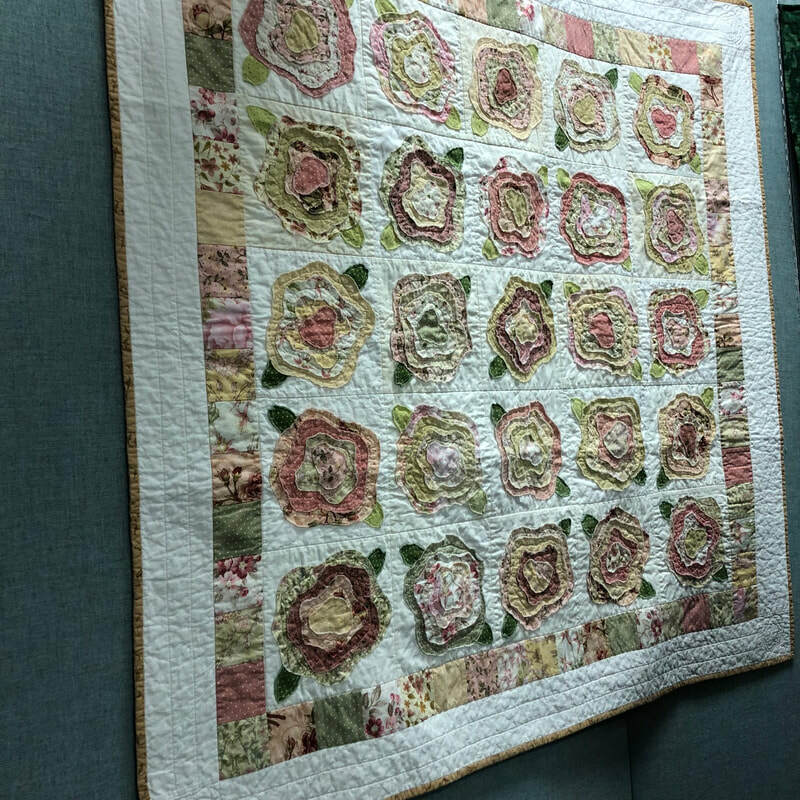 The larger quilts had been hung around the room, and I fell in love with this french roses quilt. I can't explain why I find it so beautiful, but I do. I found the pattern for it, French Roses by Heather French and bought it to make when my skills are equal to the challenge. The evening's speaker was Cecelia Reed, who gave an absolutely fascinating and fun talk about feed sacks. Who knew? She shares and continues her mother's passion for collecting and documenting feed sacks and has a collection of 18,000 two-inch feed sack swathes that began with her mother's collection. The fabric from feed sacks was used not only for quilts, of course, but also for items like shirts, sleeping gowns, skirts, curtains, and tablecloths. 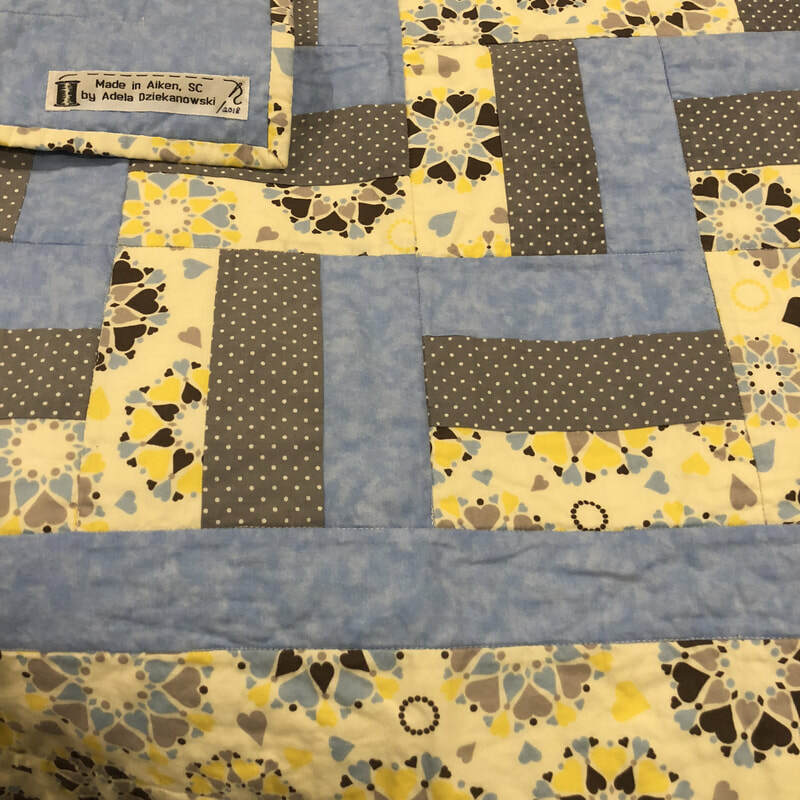 She was so pleased to have visited Aiken, because she had a hunch and bought an old quilt she noticed in one of the local stores. Upon opening it up, she found a quilt from the 1800s! If your club is looking for an interesting speaker, you can track Cecilia down through Pat's Sack of Titusville, Cocoa, FL. So, where I am I in my quilting adventure? Not too far. I made my 2nd square today, an X-block, the match to my O-block. I did everything "right." I measured carefullly. I cut carefully (but I still tend to bow with that rotary cutter). I felt for those seams and pinned carefully. I did my best to sew 1/4 in seams, using my new 1/4 inch seam presser foot. 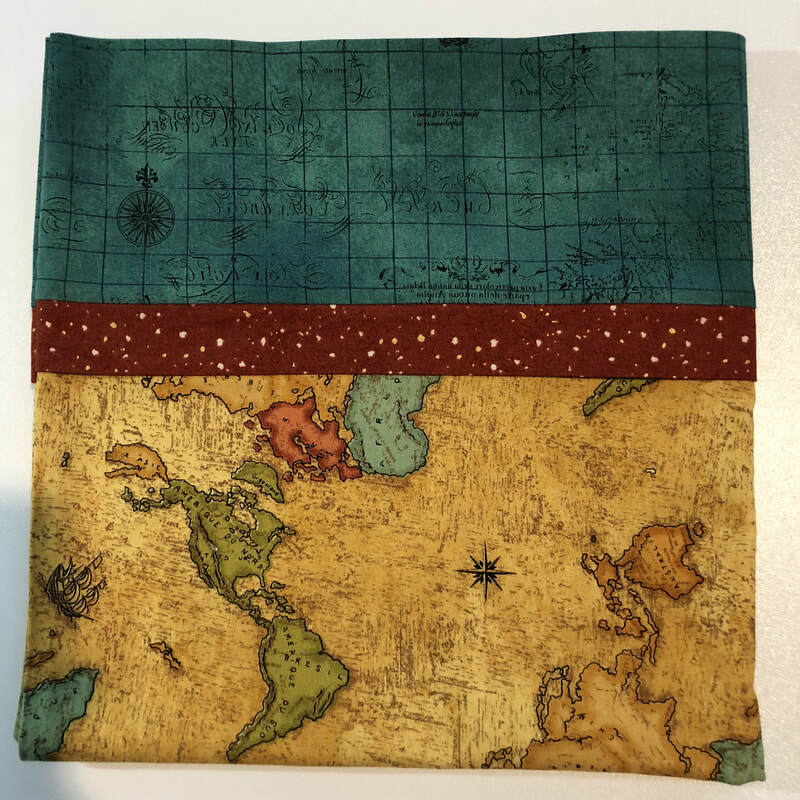 I set the seams with the my iron. I ironed the seams in the right direction, pulling a tad to make sure I didn't get a fold. I let the pieces cool before removing them. The result was a square where almost nothing lined up right and also had puckering in it. I am a teeny bit frustrated right now. Thank goodness I hate my choice of fabrics and have no real intention to use these squares for anything. 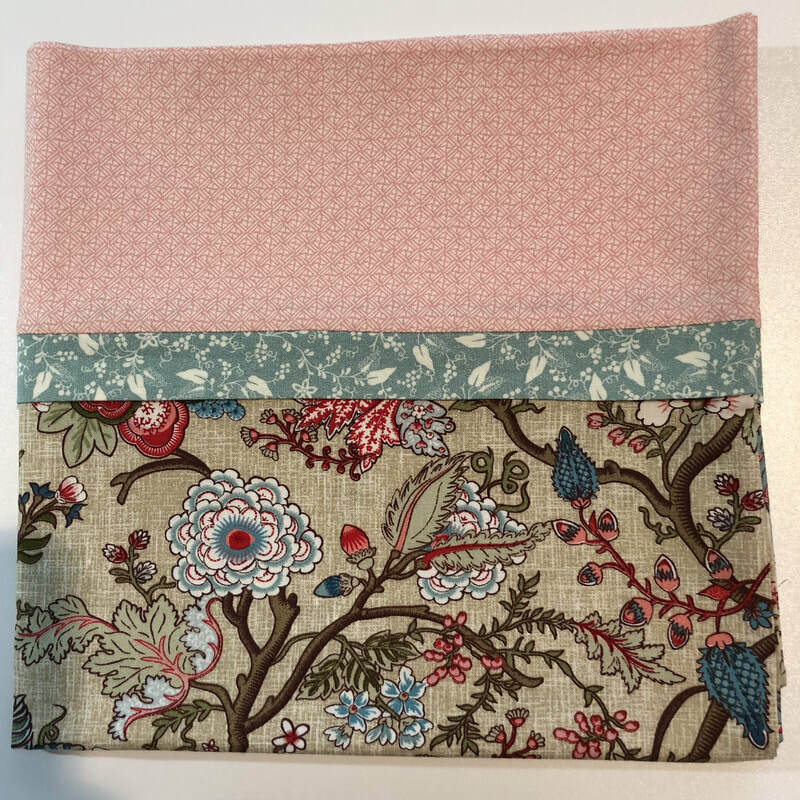 I did set up and learned how to use my sewing machine - bought in 2015 - this week. So, I am including a picture of some of my practice stitches. Now that was fun! 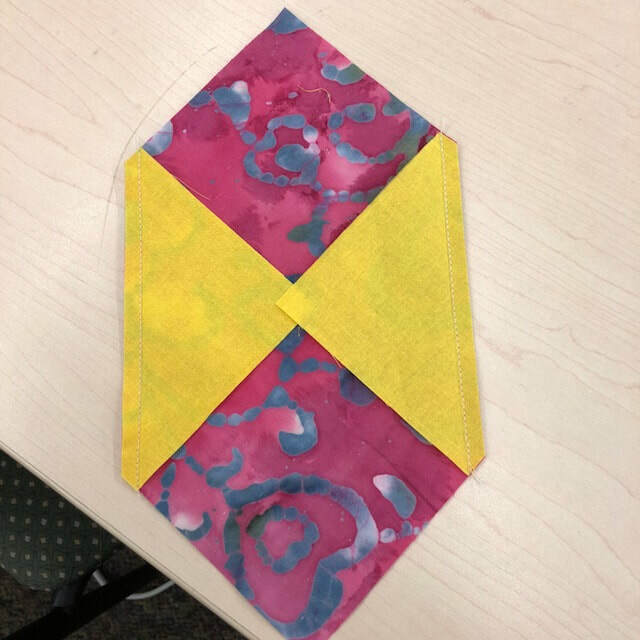 I went to a "Learn to Quilt" workshop this week, and it has taken me two days to decide that I am willing to share my product. I had to work up some courage, especially since I am proud of it, despite its many imperfections. Our instructor kept reminding us that we were doing this to learn techniques, not to create a perfect square. I wasn't sure if I was going to be able to create this again on my own, so I took some pictures along the way, mostly to help me remember in which direction to press the seams. 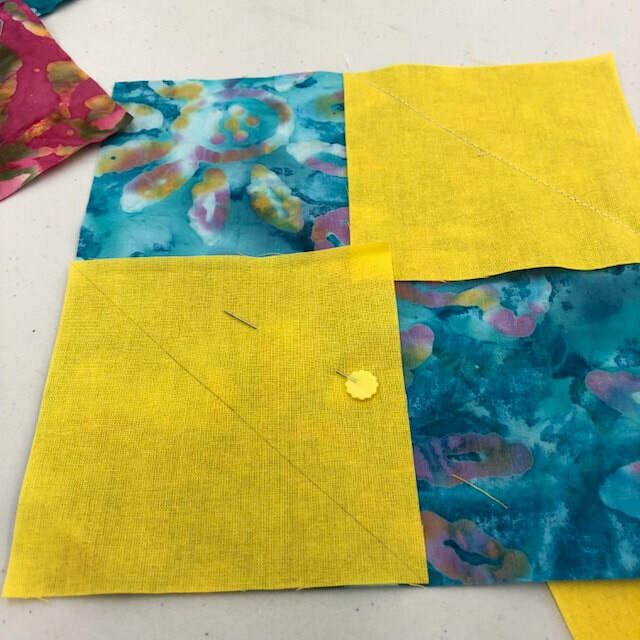 Linda Williams, our instructor at Joann Fabrics, told us to press toward the dark. OK. That made sense to me, because you won't see the seams as much under the dark. However, later on, she told me to press some seams toward my lighter color - for construction purposes. We don't want our seams going in directions that work against each other when we press them open once the block is finished. Unfortunately, my brain just doesn't work that way. How did she know what that was going to be? 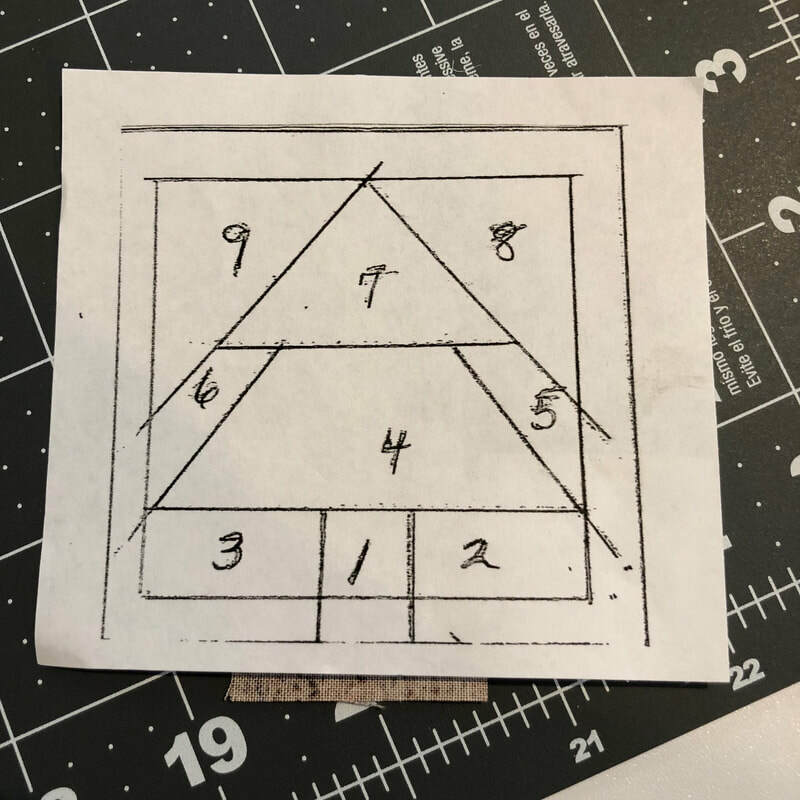 Will practice help me be able to predict, or should I purchase a few extra seam rippers? Here are some of the photos I took of the process, incuding the back side, where I discovered that my 1/4 inch seams were anything but that! I learned many things in this workshop, including the importance of being very careful with your fabric selection! 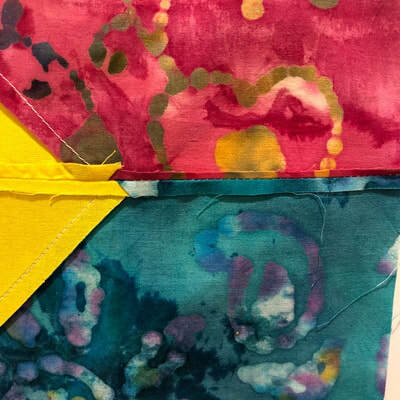 I thought the fat quarters were really pretty in their little bags and would be perfect for Easter, but I now know that I will not be using my left over fabric for anything else but practice. I should try an X square, since we were given instructions for one. All in all, it was 2-1/2 hours well spent. There was only one other student in the class, so we both received a lot of personal attention. Cheryl P lives in the same town that I do to boot. So, we exchanged information and will try to find a way to connect. How lovely! Every December, my community has a tour of homes to raise money for worthy local charities. Always a very popular event, this year was no exception. Each of the six homes had something unique to showcase for the holiday season. What immediately caught my eye as I entered one of them, were the garlands adorned with magnolias. They looked real, but it was December. I was curious as to where they came from and was stunned when the homeowner explained that they were made of balloons on wire frames. 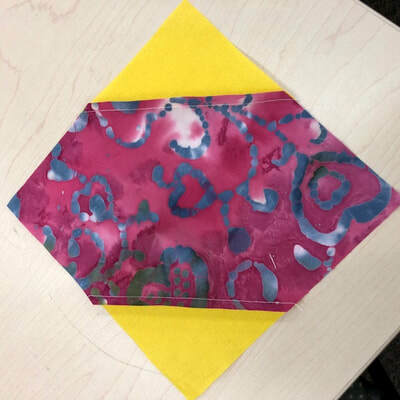 They must have been admired by many visitors, because the talented crafter was invited and generously agreed to offer a workshop showing us how to make them. I signed up as soon as I got the notice and felt lucky as the class immediately filled up. Additional sessions are coming, but mine was today! It needs a little adjusting, but here is my first attempt! In case you are wondering, the center of the flower is real. The crafter told us she waits a few weeks after the petals drop to pick the conelike carpel clusters and stamens off the tree. She then lets the pods air dry. They will shrink during this process, so they need to be about twice as large as needed when picked. The leaves are faux; a source for nice ones in my area is Carolina Pottery. We used 12 inch balloons for the petals. 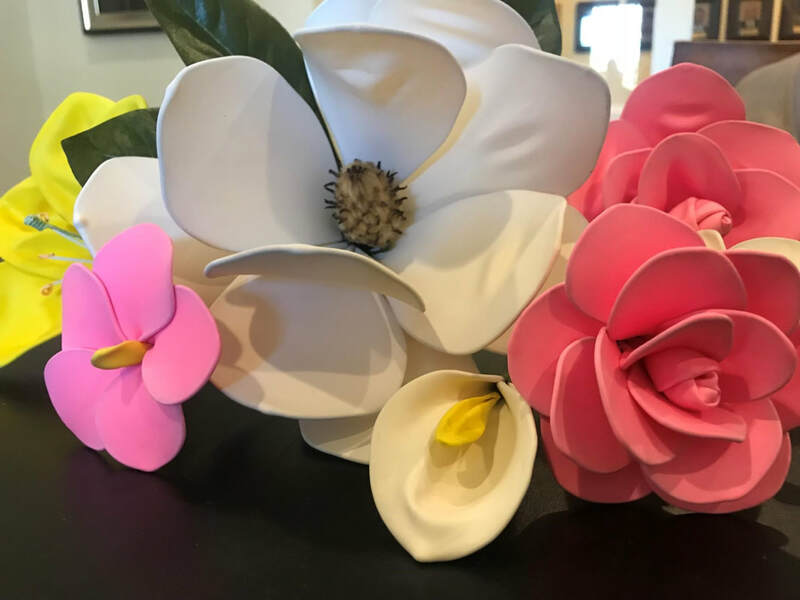 These flowers were made by our instructor, Jo Ann Crystal. 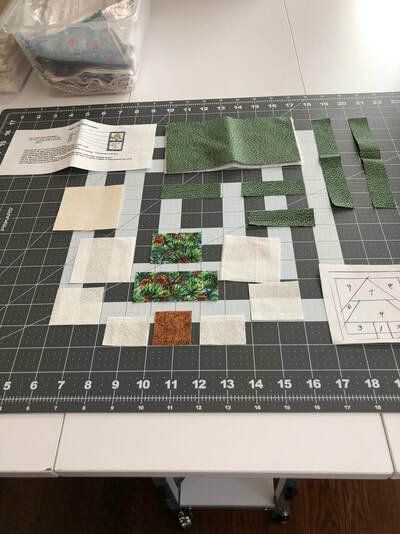 A friend was generously sharing knowledge and experience with me as she shared her expertise on quilting, something I want to try. As I was reporting my progress back to her, she suggested I blog about it. So, here I am, post #1 of my new blog, Pursuits and Endeavors. We'll have to wait and see if there are posts yet to come, but thanks for the suggestion, Linda B.
I retired. I moved. I organized my new home - well, sort of. I relaxed. I floated in the relaxation. After 40 years of teaching and non-stop activity, I felt like relaxation was my new major. Then...I was done. 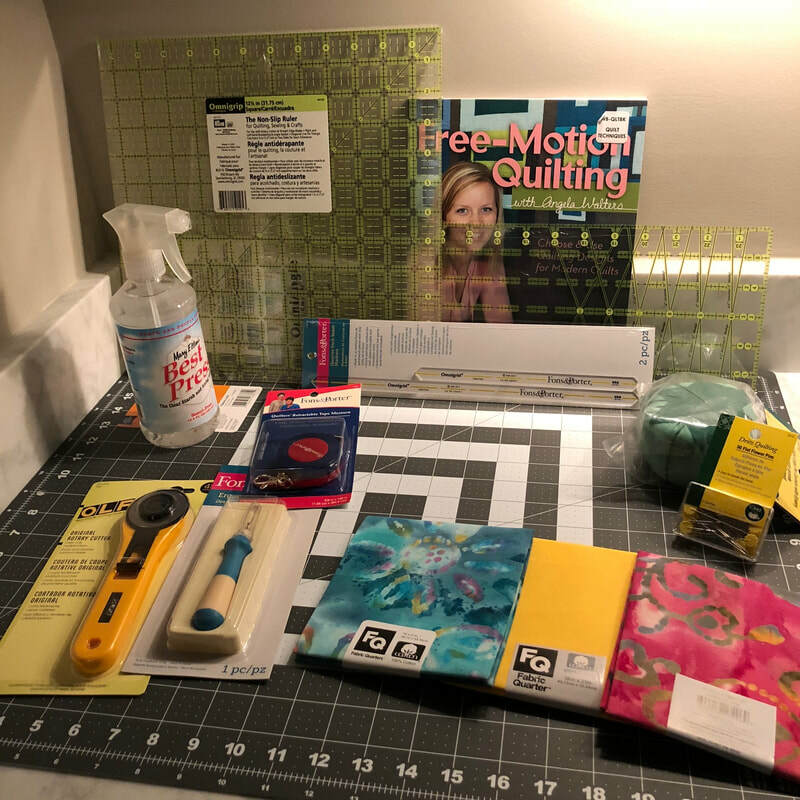 Although I still had some activities that connected me to my old professional life, I needed to add some new ones. I tried classes - all sorts of arts and crafts. I joined a book club. I pulled out my telescope and joined the local astronomy club. I joined the local gem and minerals club. Now, I am going to try quilting! ​It came to me quite unexpectedly. 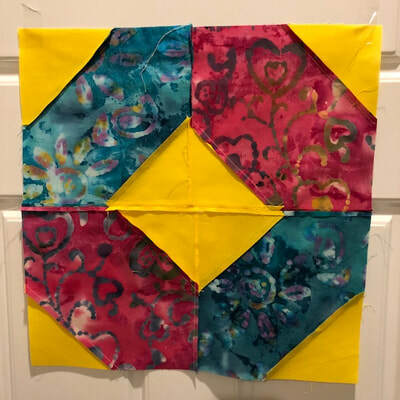 I don't even remember what I was talking about with Linda B a few days ago, but one thought led to another, and the conversation came to quilts and quilting. I started to believe that, just maybe, I might be able to make something that I have not been able to find for purchase. (I'm pretty picky.) 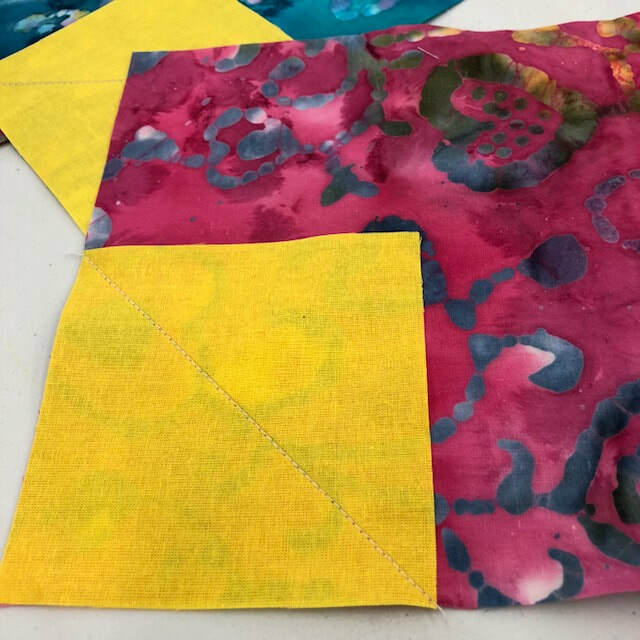 There are many challenges, including the fact that I haven't sewed anything in many years. I do have a new sewing machine. It has sat unused since I bought it as a treat to myself right before Christmas, 2015. However, I have done some light sewing in the past, so I believe I will be OK, once I sit down in front of the machine. So, true to form. I did a lot of online searching. I also pestered my friend, who gave me a a lot of advice, including a list of basic supplies. I registered for a "Learn to Quilt" class at my local Joann store this Wednesday. While in the store shopping yesterday, I met a lovely woman, Belinda R, who invited me to a meeting of Community Threads, an extension of the McCormick Arts Council at the Katurah, SC. Unfortunately, the club is quite a distance from my home, but I do look forward to making it there once in a while. I'll let you know how the class works out.